Personalize your filing system by adding some glamour and style to how you sort letter-size documents. Choose the Bold Basics design to leave a lasting impression on customers the next time you leave behind a proposal stored in a stylish Zip ‘N Go Reusable Envelope. 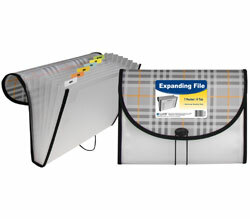 This file is ideal to use when transporting letter-size documents. Use the clear side to display a cover letter, while the back side features a unique pop of color and an eye-catching design. The zipper seal secures documents in place, while the heavyweight polypropylene protects the contents inside. Size: 8-1/2 x 11. 3/PK.